Video can be an effective tool when used appropriately. I believe that it is often overused (the value of talking head video to me is a negative one) but good uses include demonstrations of things that are essentially visual and involve motion and cannot be described easily. The most powerful use of video is performance feedback which has become a mainstay of athletic training but we haven’t figured out how to do that on the web yet. More vendors are adding video capability to their platforms often beginning with just links to Youtube. Social learning uses tools like Facebook, Twitter, etc. to stimulate learning and team work in both schools and companies but there is still a perception that these tools are time wasters and there are some valid security issues. Many eLearning vendors are adding social learning elements to their platforms which can range from links out to Facebook, etc. to strictly in-house tools. Mobile – students and workers are demanding that they use a single mobile tool (smartphone, tablet, laptop) to access their resources. There are both technology and design issues (accommodating the different platforms and form factors) but it is being accepted (perhaps more slowly than some would prefer) and will become common for just-in-time learning (performance support) and testing. From the Mobile Learning Pulse Survey Fall 2012 conducted by The MASIE Center – led by Elliott Masie, Bob Baker and Videhi Bhamidi http://masie.com/Surveys/mobile-pulse-survey-2012.html. “Interest in delivering learning on mobile devices is high but implementation is in the very early stages of development. 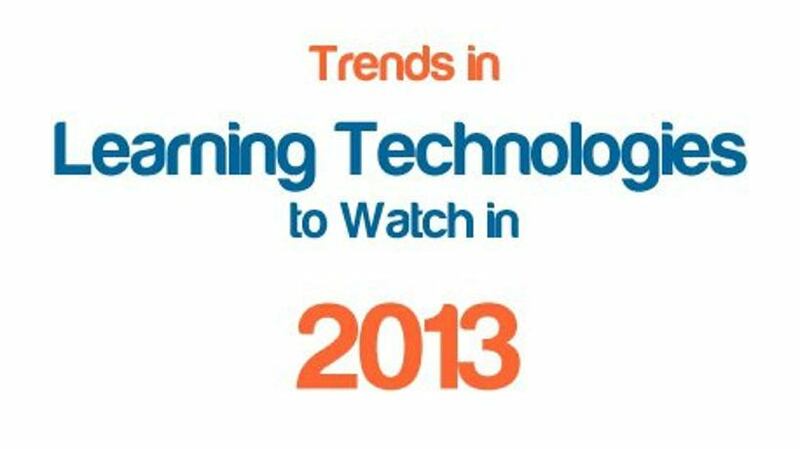 Approximately 80% of organizations reported at least a moderate interest in mobile learning. So far that interest has primarily translated into projects to explore and test mobile learning and developing some content designed for mobile devices. At the same time, less than 30% of organizations have an enterprise strategy for mobile learning.”The new Tin Can or Experience API from SCORM (see below) should help facilitate this. Of course, the latest hot topic is mobile video. E-texts – one initiative that has been widely accepted and adopted although we are still in the adoption phase. Of course the publishers have resisted it for years, to their detriment, but are now getting on the bandwagon. This includes Apple iBooks, Google Books, Amazon Kindle, etc. and also specific publishers of e-tests like CourseSmart, Pearson and McGraw-Hill. Cloud-based systems (SaaS, hosted, off-site) are being rapidly adopted - the majority of requests for LMS’s are now in the cloud as opposed to being hosted on site. Integrated Talent Management and Consolidation: In the corporate sector, integrated talent management solutions (including recruiting, compensation management, performance and succession management, and learning management) are growing rapidly. Major players are getting into this business by buying other companies. Oracle acquired Taleo which had previously acquired LMS vendor Plateau. Success Factors bought Plateau and Taleo bought Learn.com. IBM bought Kenexa which had previously bought Outstart. This makes Oracle, SAP and SumTotal the leaders in this area. Look for more of this to happen. There are at least three important players in this area Ultimate, Workday and Ceridian who do not appear to offer learning management as part of their offerings. They may be looking to buy an LMS. For the latest on this see Josh Bersin’s overview at http://www.forbes.com/sites/joshbersin/2012/11/29/the-talent-management-software-market-continues-to-explode/ and the Bersin and Associates website http://home.bersin.com/. Gamification. It has long been known that games and simulations are the most powerful learning tools we have short of the real thing. For many years, just as with social media, some employers have been suspicious of games as just time wasters and have banned them from their computers. Recently the idea of using games or elements of games for learning has become a hot trend mostly in the corporate sector. Gamification can be as simple as using game elements within courses such as giving points to students and employees for participating or a Jeopardy game with a specific learning goal or as elaborate as an extensive simulation. A wiki on the topic can be found at http://gamification.org/. What Video Games have to Teach us about Learning and Literacy by James Paul Gee. See also the blog by A. J. George http://iconlogic.blogs.com/weblog/2012/11/elearning-how-to-incorporate-gamification-elements.html. The Tin Can API. The new SCORM (ADL/AICC) Tin Can API (now known as Experience API). Now will facilitate the use of and track the latest technologies – mobile, games, simulations, virtual worlds, informal learning. A draft specification was released in 2011. The final specification is due in spring 2013. It has already been adopted by 30 vendors with more coming. Although the term MOOC (no doubt derived from MMOG Massive Multiplayer Online Games) was coined in 2008 to describe a pioneering open course that a pair of Canadians - George Siemens (a professor at Athabasca University) and Stephen Downes (the Senior Researcher for the National Research Council of Canada) developed. Stephen has a background in philosophy and now specializes in the fields of online learning, new media, pedagogy and philosophy. He writes prolifically on Stephen’s Web “a digital research laboratory for innovation in the use of online media in education”. The topic for the first MOOC was Connectivism and Connected Knowledge see http://thoughtstreamblog.ca/what-is-a-mooc/. Canadian universities have been a bit slow to adopt MOOC’s but the University of British Columbia and the University of Toronto have joined Coursera. See also Kahn Academy. (free non-credit courses). Edutech Classroom Capture & Delivery System (Edutech). Part of the Learning Ecosystem that includes an LMS, content authoring, and collaboration. Mining Big Data to Help Students http://campustechnology.com/Articles/2012/11/15/Mining-Data-to-Help-Students.aspx?Page=1. Educational institutions (universities in particular) have often accumulated a great deal of data about students in different systems like Learning Management Systems (LMS), Student Information Systems (SIS), etc. This is referred to as Big Data. Now tools are being developed to mine this data so that instructors and advisors can monitor student progress and advise students accordingly. Austin Peay State University (TN) In 2011, the school launched Degree Compass, a course-recommendation tool that offers personalized suggestions in a way similar to Amazon. Civitas Learning Community is a nascent network of four-year institutions, community colleges, and online universities that will link their homegrown Big Data solutions to a normalized data model built across the institutions. Predictive Analytics Reporting (PAR) Framework is a collaborative multi-institutional data-mining project supported by sixteen WCET member institutions. PAR utilizes "Big Data" exploratory techniques to look for patterns that identify causes of student loss and momentum in online learning. Arizona State University (see "Dashboards Deliver Data Visually at ASU"). alwaysprepped tackles the big data problem in education by aggregating and analyzing the most important elements of a student's classroom performance on a single dashboard. Smith System KeySix(SM). For driver safety management. Integrates and analyzes data from different systems. Free tools: An increasing number of vendors are offering free LMS’s or authoring tools. Education: Blackboard, Desire2Learn, and Moodle still dominate the education sector. Both Blackboard and Desire2Learn have recently offered significant upgrades. There are some new players on the horizon who have made significant inroads – Instructure Canvas, LoudCloud, CampusCruiser and Edmodo. I see statements like, “A growing number of institutions are moving away from the traditional instructor-focused teaching model to a new student-centric approach that favors a more personalized, collaborative, anytime-anywhere—from any device—learning experience.” http://campustechnology.com/microsites/2012/verizon_12a/home.aspx. Balderdash! Universities have talked about this for decades and there has been little change. They will be forced into offering online courses because of market demands but online technology will be an alternative that will be embraced by only a few faculty. On-campus courses will continue as they have for centuries. Educational publishers: In a significant development, McGraw Hill Education (one of the largest educational publishers) was purchased by Apollo Global Management, LLC. (An investment firm apparently not associated with the parent company of the University of Phoenix.). At the same time Pearson (the largest educational publisher) is getting into the online market aggressively with its purchase of several companies including eCollege, Fronter, The Learning Edge, Skillpill, and Connections Academy. Pearson offers several LMS’s to its clients including the new free one - OpenClass.